Companies that take safety seriously protect their workers from all kinds of potential injuries, preserving the well-being of those workers and their families as well as keeping people on the job. But no matter how carefully safety plans are developed and maintained, accidents happen anyway. OSHA says on this topic, " It is a requirement of OSHA that employees be given a safe and healthy workplace that is reasonably free of occupational hazards. However, it is unrealistic to expect accidents not to happen." Accidents still happen, and you need to prepare for them. Medical first responders save lives every single day. But unless emergency medical personnel are onsite when an accident happens, precious time is lost in contacting them and waiting for them to arrive on the scene (and by the way, do you know how long it takes for an ambulance to get to your worksite? That's one critical piece of data which needs to be incorporated into your safety planning). Having staff who are trained in appropriate first aid can bridge the gap between the moment when an accident happens and the moment when emergency medical personnel arrive to begin treatment. Providing good first aid treatment gives you onsite "first responders" who can accurately assess the situation, determine if protective gear is necessary for people who are coming to help, and provide the right kind of first aid to minimize the impact of an accident. 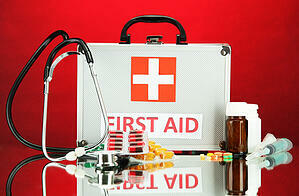 It's not enough to send a few employees to a general first aid training course. The hazards of an office job are vastly different than those of a warehouse, which are different again from those of a foundry, and again different from a construction site. Just like every worksite has specific hazards which must be taken into account to form safety plans, every worksite must identify its own first aid needs and provide appropriate training. There is also a value in providing basic first aid training to all personnel, including CPR training and recognizing the signs of heart attack or stroke. This can help to save lives in the case of a medical emergency which is not the result of an accident. But there should also be staff trained to respond to the specific types of accidents which may happen on a worksite, and all staff should be trained in the correct procedures to alert these individuals when necessary. Great safety planning and training can ensure that accidents are few and far between, but accidents still happen. Safety plans aren't complete until they take this into account and provide appropriate first aid supplies and training.